In addition to our KrystalCast®styles, we also offer similar products that have been produced under Tables International: ColorCast®, ColorFlex®, ExtraFlex® and StoneEdge®. 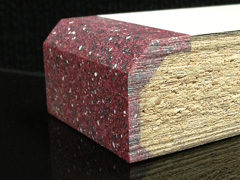 All tops are constructed from 1 1/8″ thick 3 ply flakecore of 45 pound density and a phenolic impregnated backing sheet. Scratches, stains and burns can be easily removed from ColorCast®, ColorFlex® and ExtraFlex® edges by using 600 grit wet sandpaper and then polishing back the original luster with rubbing compound. Backing of each and every table is recycled and wood used is certified. A seamless polyester resin edge in a gloss polished finish. 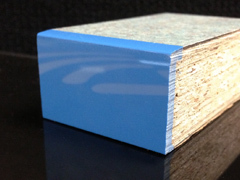 ColorCast edges can be combined with plastic laminate, wood veneer, linoleum or Corian®. A resilient new table edge that can withstand years of tough use. Bump it… thump it…drag it… The durable new colorflex seamless edge holds up even in the most difficult applications. Colorflex is easy to maintain because the edge becomes an actual part of the top… seamless, sanitary and impact-resilient. 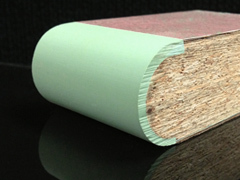 Colorflex edges are available in various colors. ExtraFlex is similar to ColorFlex except that is more pliable and resilient. Recycled resin chips are what make up the look of the StoneEdge green product. This particular edge can be any edge profile as well as having a laminate top.